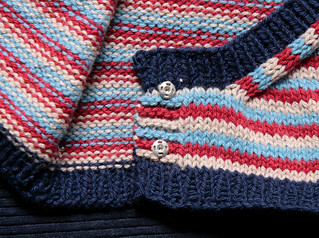 A seamless baby wrap-cardigan in DK weight cotton, with contrast edging, buttons and hidden press-stud fastenings. 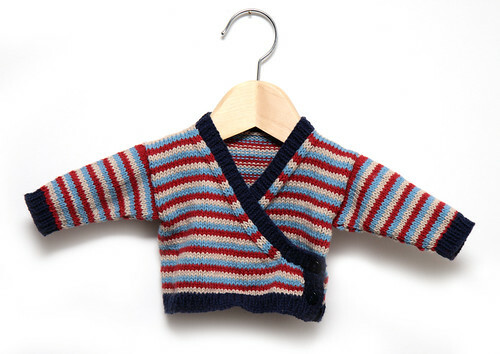 The body is knitted in one piece with the sleeves knitted onto the armholes in-the-round. I wanted to create a garment for a friend’s new baby boy that would be comfy and easy to get on and off. 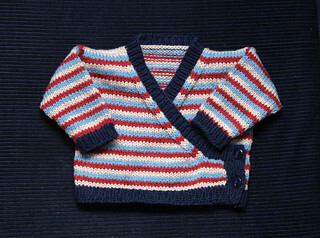 There are plenty of cardigan patterns for baby girls, but I couldn’t find anything that would suit a baby boy so I decided to create one. I chose easy-to-care-for cotton. But, as cotton can be stiff around the seams, I opted for seam-free construction. The sleeves are knit on a circular needle using the magic loop technique, double-pointed needles could also be used. Shoulder sections are joined using the three-needle cast-off (that’s ‘bind-off’ to US English speakers). This technique is a bit fiddly but well worth it for softer, flatter seams. This pattern also uses the basic intarsia technique to join areas worked in different colours. The sample shown is striped but the instructions are for a single colour with contrast edging. The sizes are based on the standard baby measurements on Yarn Standards, but I have modified the proportions, reducing widths slightly, based on feedback from parents. If in doubt, measure the baby! Choose the size closest to the baby’s body circumference and add or reduce rows at the suggested point to obtain the desired length. Continue working rows 1 & 2 until work measures 6.5 (7.5, 7.5, 9) cm / 2.5 (3, 3, 3.5) in., ending with a ws row. Add or reduce rows here in order to achieve desired garment length. Continue, decreassing on rs only, until work measures 13 (14, 14.5, 15) cm/5 (5.5, 5.75, 6) in. Work to second marker, turn. Working on these 52 (58, 63, 66) sts only, continue in stocking stitch until work measures 23 (25, 27, 28) cm / 9 (10, 10.5, 11) in., ending with a rs row. Continue without shaping until sleeve measures 11 (14, 17, 19) cm / 4.5 (5.5, 6.5, 7.5) in. Sew on press-studs to fasten garter stitch edge of left front to inside of right front, taking care to make stitches invisible from the right side of right front. I am knitting this in Patons Grace cotton using Azure and Ginger colours ! Show off your project! Add your photo to the It's a Stitch Up Flickr group and tag it with 'babywrap'.